The E-waste processing industry in Ghana has in recent times attracted much interest and research. However, one major hurdle in researching this urban phenomenon is inadequate records on volumes passing through such places as Agbogbloshie. This situation makes the task of describing it with specific and accurate numbers very difficult. Motivated by this, the AMP team has undertaken to gradually map out the quantities of metals passing through this most complex open air factory. 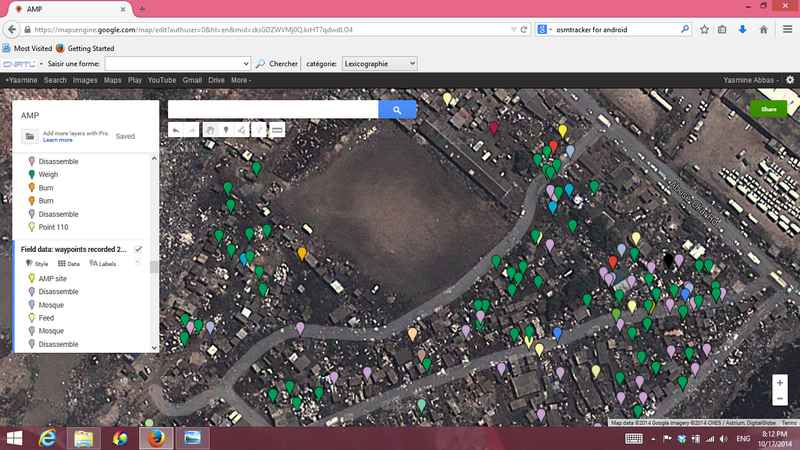 On the map below are GPS locations of burning, dismantling, mosques among others in Agbogbloshie. The GREEN points indicate weighing scale locations. 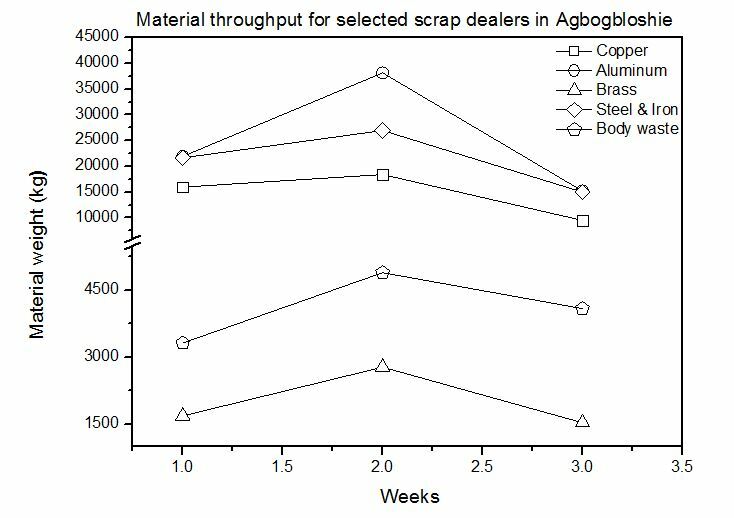 In collaboration with our field agents, we devised a simple way to quantify the volume of urban mining happening in Agbogbloshie. First, we mapped the scales (see picture above), which are the points at which large volumes of metals are weighed. 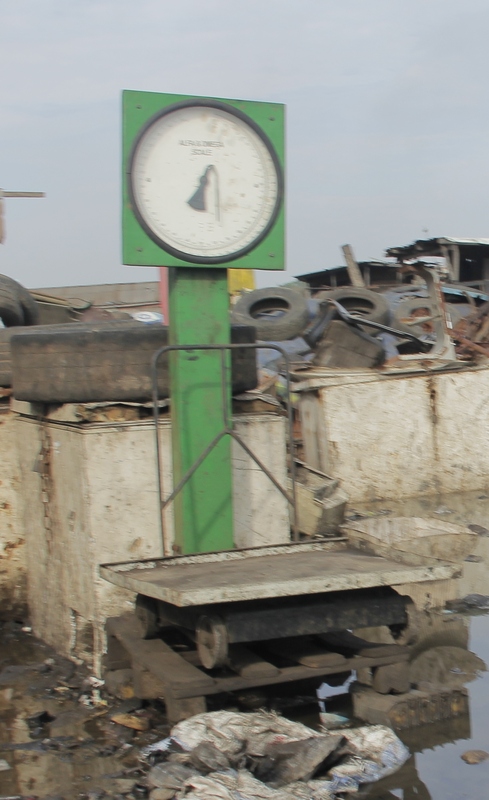 We then proceeded to collect on a daily basis, the amounts of scrap metals weighed at these places. 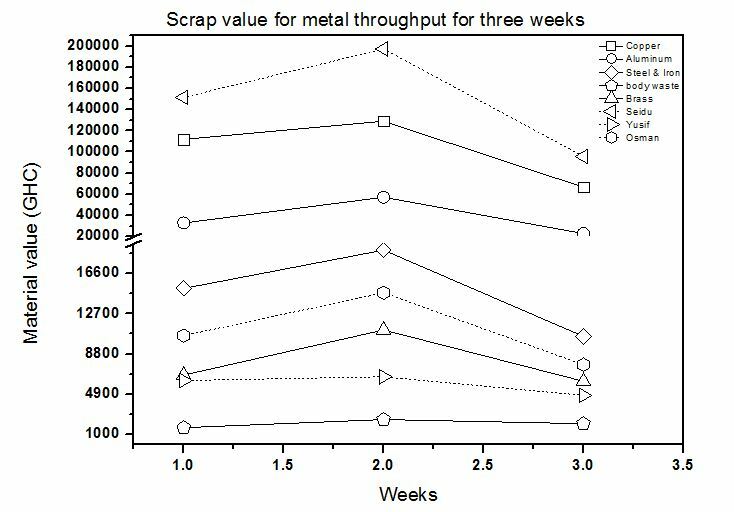 In what we considered to be the pilot phase, we recorded over a three week period, the figures from a select group of scale owners and then, analyzed these graphically. One finds, there are ferrous metals, non-ferrous metals and plastics. During the process, we realized that, significant volumes of steel from such large equipment such as cars are not weighed due to their sheer size. They are rather sent straight to steel processing industries such as those in Tema. Hence, even though the graph indicates aluminium as the largest, this only refers to household appliances that are regularly weighed and documented. In the future, this “lost” data will be retrieved from these industries. At the current rate, copper is the most valuable metal ( 7 GHC/pound) followed by brass(4 GHC/pound) and aluminium (1.5 GHC/pound). 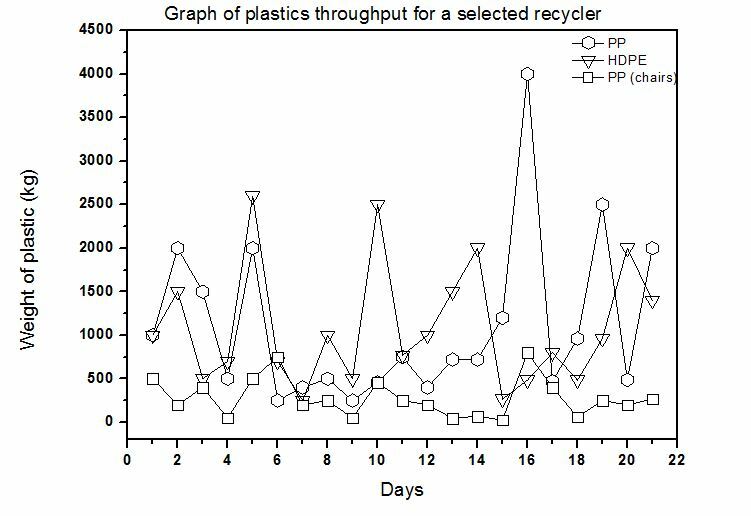 When it comes to plastics, the most commonly processed are polypropylene (PP) and high density polyethylene (HDPE). At the end of the month of November, the team will go on a massive data hunt, collecting on a much larger scale, this kind of information from all over Agbogbloshie. You are welcome to volunteer! !